WASHINGTON — Denver Nuggets coach Michael Malone didn't know how his team would respond to clinching its first playoff berth in six years. 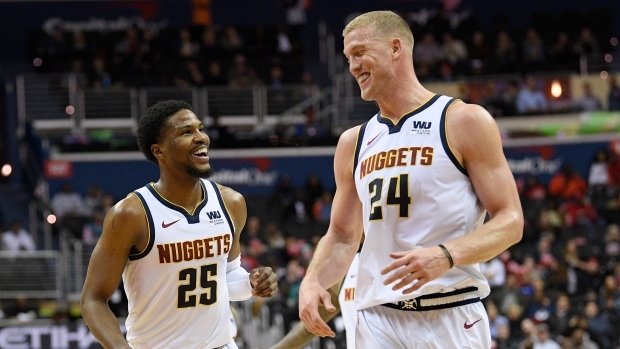 Nikola Jokic had 15 points and 11 assists, and the Nuggets used a balanced offence to edge the fading Washington Wizards 113-108 on Thursday night for their fifth straight victory. Paul Millsap, Gary Harris, Jamal Murray and Torrey Craig also added 15 points for the Nuggets, who were playing for the first time since ensuring their post-season spot Monday in their win over the Celtics. "I think it's so important to make sure you're playing at the highest level you possibly can going into the post-season," Malone said. "And we've still got some things to play for. Being a division champion is something that we talk about. Trying to get that one seed, why not us? With 13 games to go, way too early to talk about preservation mode."